On this day of our country’s 150th anniversary, I’m at home alone. My husband is in Europe and the rest of family and friends live away or have other plans. I’ve never been one to join the hoopla and rah rah of nationalism. Right now I’m in the best place I can think of… my own home, on my own. My plan is to stay put all day. This morning I walked along our road on my usual circuit. A toad killed by a car caught my eye, and I carefully removed it to a shady bush to spare it further indignity. Such a fleeting little life, snuffed out. It reminded me how we humans occupy a similar small space in the grand scheme of the universe. Even 150 years pales in comparison with eternity. So for this notable day, I chose as my model for meditation a grand old tree, the Comfort Maple of Pelham, now thought to be 500 years old. Like me, she has deep roots, older than the country that holds her. Hers draw on soils built over thousands of years with the bodies of billions of life forms. She breathes air from the breath of ancestors, human and pre-historic. My roots are formed from my ancestry of French and Scottish settlers mixed with North American Aboriginal blood. My breath is her breath. We share the present and the past. The Comfort Maple doesn’t need a day of celebration – she is a celebration in herself. Each day, each minute, is a full appreciation, a prayer, of the moment. But as upright as she is today, she is declining, well past her best-before date. She is a grand old dame, destined for the same dust she has drawn upon for centuries. If she’s allowed to die naturally, she will stand for a few more decades, slowly returning to the soil all that she has taken, and more, will provide nesting and breeding space for a whole new set of creatures. Her passing is every bit as important to the natural world as her many years of service in life. Countries, as we know them, also come and go. We don’t know what will happen over the next 150 years. My hope for our country mirrors my hope for humanity: that we will thrive without ever putting ourselves above the common good. The only purpose for borders is to keep other countries from impinging on a set of arbitrary freedoms, goals and regulations. The natural world does not make borders. At some point in the future, perhaps all borders must dissolve for a united world, and, at the risk of sounding disturbingly unpatriotic, I hope we have the trust and courage to let ours go if such a remarkable opportunity presents itself. I adore this country, and celebrate it every day with all my heart and soul. I feel so lucky, so grateful to have been born on her soil. I’m in full support of parades and parties, and all the positive energy around them. 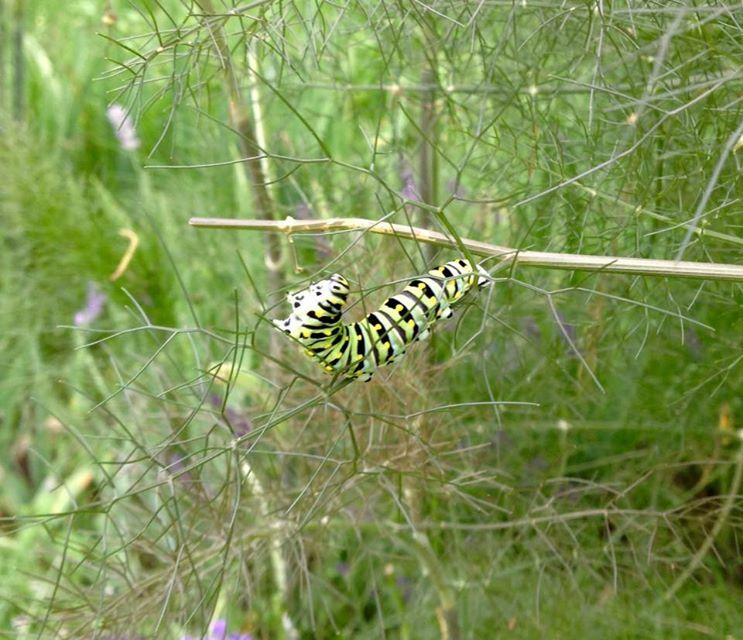 But as for me, I will stay near and quiet today, listen to the birds, note the shadows, hold a caterpillar in my hand. This is my Canada, my beautiful beautiful Canada. May we accept the wisdom of an old maple, who by gracefully surrendering to the present, teaches us all we need to know for the future. 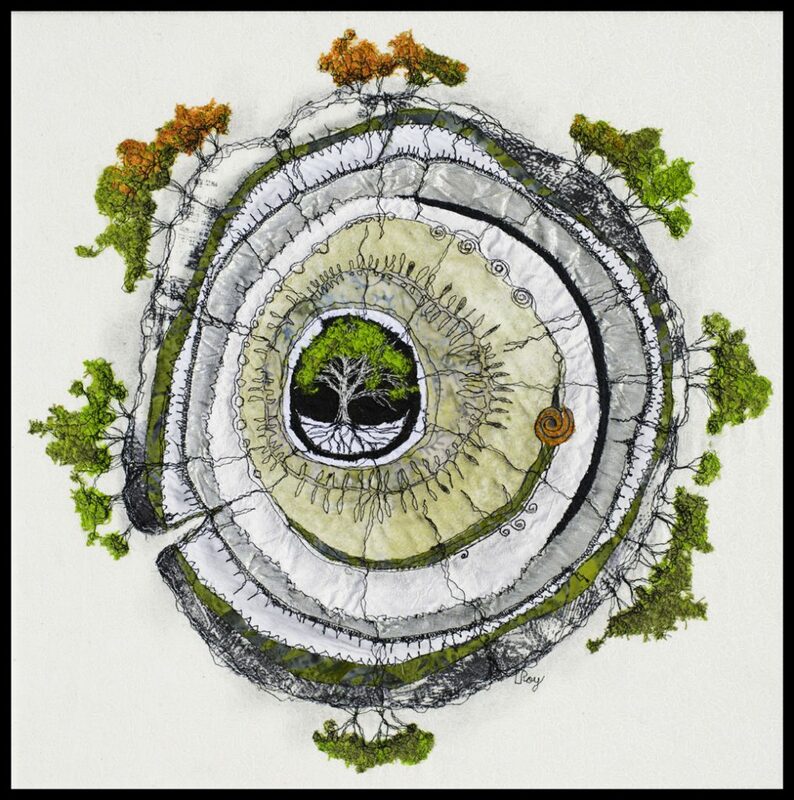 Lately I’ve enjoyed portraying particular trees, either for the great stories associated with them, or because of their exalted status as Designated Heritage Trees. In my search for a tree that might exemplify the true Canadian spirit to honour Canada’s 150th anniversary (and to submit to a local juried show), I came across a truly marvelous specimen who lives in Pelham, Ontario in our Niagara Peninsula. 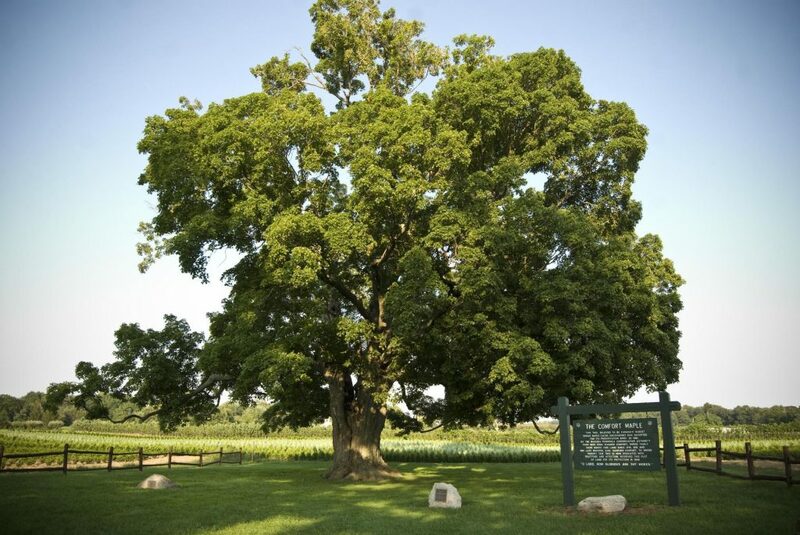 The Comfort Maple is believed to be the oldest and finest sugar maple tree in Canada. It lives on half an acre of land purchased by the Comfort family in 1816 and later entrusted to the Niagara Peninsula Conservation Authority, to protect it for its historical and biological significance. 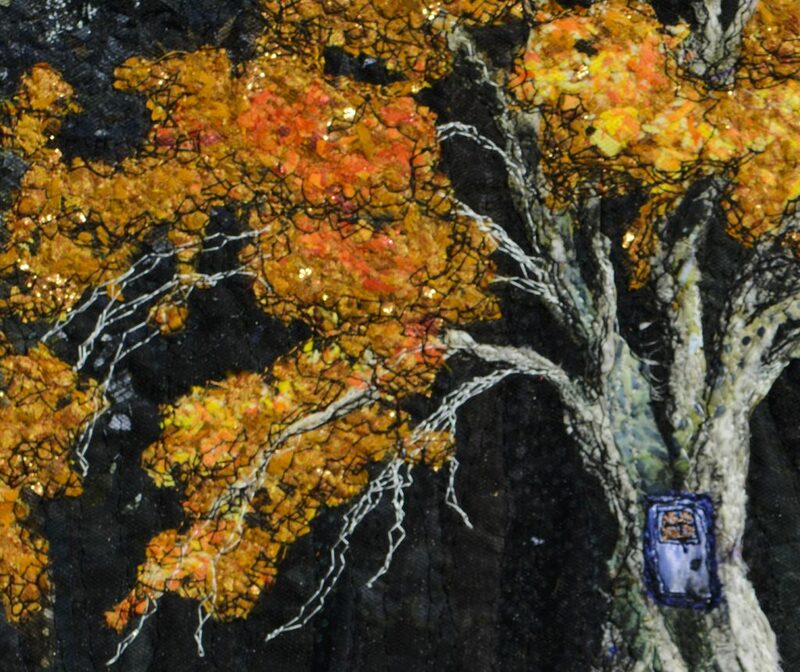 In 1975, the tree was estimated to be 400-500 years old by the Ontario Forestry Association. This tree towers about 80 feet at its crown, with a trunk circumference of 20 feet, which is crazy huge for a sugar maple. Despite its age and exposure to at least two bouts of lightning, this is one stunning tree in all seasons. How to portray the story of this lone giant? I looked at all the available images from winter to fall, checking colour variations, bark texture, position of branches and location in the landscape. I found several articles that discussed its history, age, and issues of preservation. I was struck by the thought that, at 500 years old, this great old maple must have germinated in old growth forest, yet now it finds itself surrounded by tilled land with no other trees nearby. I wanted to bring this contrast of past and present into the piece. 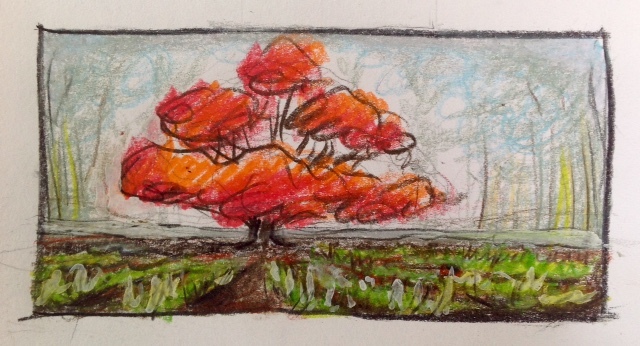 I started with a coloured thumbnail drawing that included a field and shadowy forest in the background, shown during the day, in the fall season. But sadly, the design lacked that certain ‘je ne sais quoi’. Why not change it to night, I debated, for a stronger sense of mystery? The shadowy forms behind the tree would recall the primordial forest which existed when the maple was a tender seedling. In front of the tree could stretch the rows and furrows of its newer agricultural surroundings. Fine then, Drawing #2 it was! But… maybe a change of frame shape… should I make it a bit deeper to show more of the field rows? Hmm. Time passed (insert sound of sewing machine, and some thread, cottons, silks, yarns)…. In my sketches for a new piece, I rarely put in all the details. A lot of the good stuff happens right on the piece itself. I trust that as I focus on the theme for those long hours, fresh relevant ideas will come. 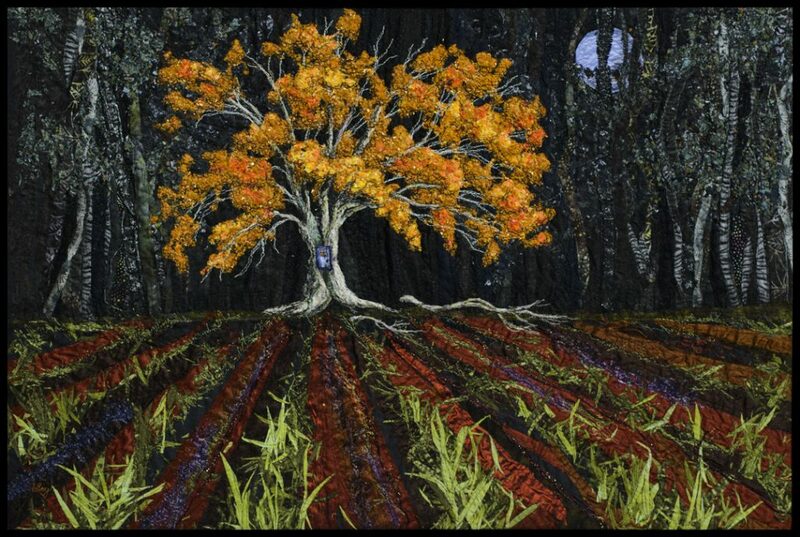 As I began the background work I wondered how to address the long interval in time between sapling to ripe old age. What if we could tap the half-century long memory of this magnificent specimen? So I added a small closed door in the trunk, to honour the stories it might love to tell us, if only it could. Because I’m an artist. I can do anything. 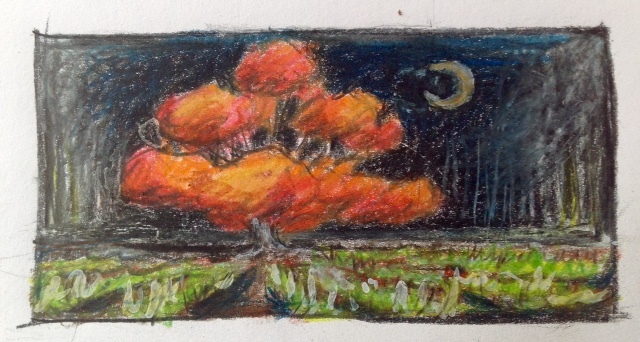 For colours – that particular bronzy yellow/orange from one of the fall photos was a frustrating challenge to capture. After some experimentation, I combined five different shades, colours and metallics in tiny snippets to get the right effect. 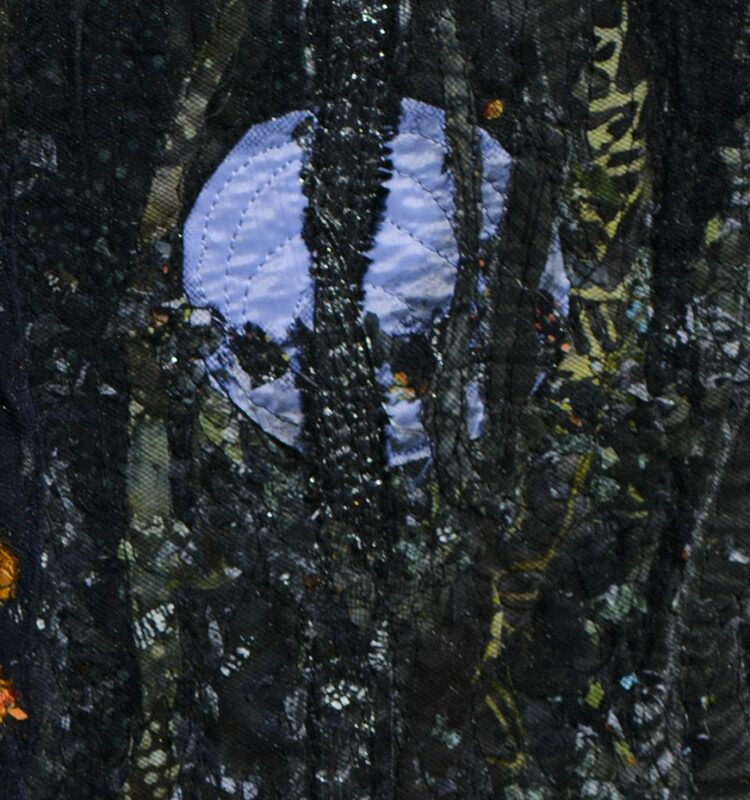 And the moon… well a rare tree like this can only occur once in a blue moon…. so that choice was made for me. 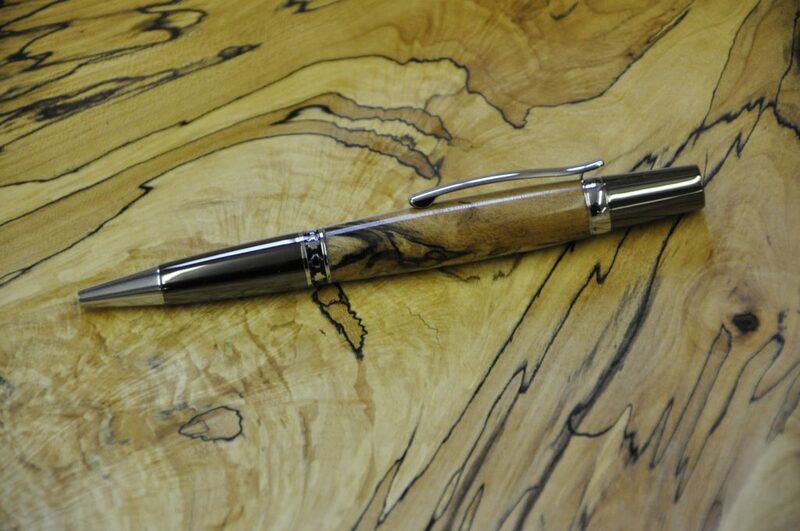 Wood artist Marv Ens of Pelham is making beautiful pens from the wood trimmed from this tree. Proceeds from their sales go to the Niagara Peninsula Conservation Foundation to continue their good work. It comes with an embossed display case and a Certificate of Authenticity. At $75, this is THE perfect gift for any environmentalist. To order one, contact Genevieve-Renee Bisson, Foundation Coordinator, Niagara Peninsula Conservation Foundation at (905)788-3135 ext. 260 Website: www.npca.ca. Comfort Maple pen by Marv Ens. Entries (RSS) and Comments (RSS). © Lorraine Roy. All Rights Reserved.